Spot On Relief Cool Spray is a topical analgesic that provides relief from muscular and rheumatic pain. Pain causes a negative effect on the body. Pain affects an individual’s ability to work, mental well-being, sleeping patterns and relationships. 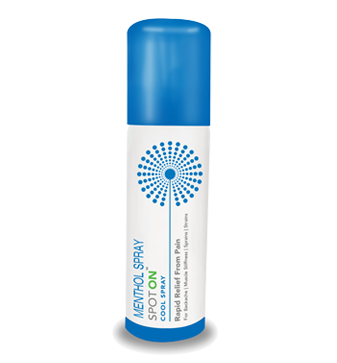 Spot on Relief Cool Spray is a topical analgesic that provides relief from pain caused due to many reasons. Spot On Relief Cool Spray is a topical analgesic that provides relief from muscular and rheumatic pain, sprains, strains, sciatica, and stiffness. The menthol present in the formulation widens the blood vessels present near the skin surface. This widening of blood vessels causes a cold sensation and relieves pain. Shake the container well before spraying. Hold the can nearly 6 inches away from the skin and point it on the painful area. Press the button and spray in 2-3 shots.